"I was given tools to remove major nerves before a speech... very powerful!" ​"I became aware of critically important things in presentations which I was not aware of before." ​"I feel much more confident when speaking." "Style, techniques, structure and preparation guidelines all excellent. 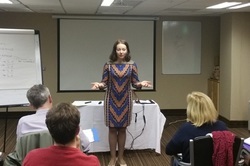 I understand the process of public speaking much better"
Get started in the world of public speaking and presentation skills with our high energy, fun packed, informative and inspiring 7 hour seminar. Learn the essentials of delivering workplace presentations. Gain valuable world class tips, tools and techniques. 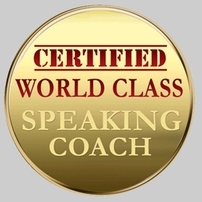 Learn how to shed your speaking fears forever. Cultivate your confidence. Discover your road to mastery in a warm encourgaing environment. No prior speaking experience is required. 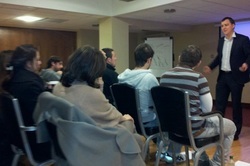 Our seminar is a high-octane interactive 7 hour session designed to be stress free, fun and highly educational. All attendees are given the option to plan a short presentation throughout the day by working through our Essentials Worksheet. You are given the chance to perform a 5-10 minute presentation in the afternoon. You don't force you to speak, but we will encourage you to give it a try. We also provide detailed constructive feedback to catapult your skills to the next level. Our 1-Day course is desgined for anyone who wants to get started in the world of work-related speaking and presentation skill building. If you are a business owner, employee, freelancer or student our course is exclusively designed to kick-start your skills quickly. We provide the groundwork for mastering the psychology of emotionally empowered public speaking. We offer world class insights into how inspiring, persuasive and technical presentations are structured, written and performed. We have modules that cover script writing skills, vocal tonality essentials, body language skills, conquering fears and tools for emotional empowerment. ​Learn the secrets of emotionally empowered speaking so that you can eliminate your fears and stresses forever. Take the hassle out of the planning, practicing and performing process. Gain a lasting confidence. 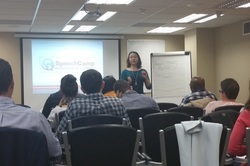 Learn life-long speaking skills that will boost your professional and personal life. 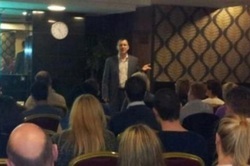 Feel truely empowered for the first time in your life as a speaker. Our next 1-Day Seminars take place on Saturday January 14th 2017 in the Academy Plaza Hotel, 10-14 Findlater Place (just off O'Connell Street), Dublin City Centre. HOW MUCH AND HOW DO I BOOK? Your investment is only €125. You can pay online below (via Paypal or credit card). If you have any questions, queries or specific requirements feel free to contact us. Please read our terms and conditions before booking.